More than 1,100 people worldwide have died from swine flu since it emerged in Mexico and the U.S. in April, according to the latest figures from the World Health Organization. As of July 31, the total number of victims killed by the H1N1 virus, also known as swine flu, stood at 1,154 — an increase of 338 since WHO’s previous update on July 27. 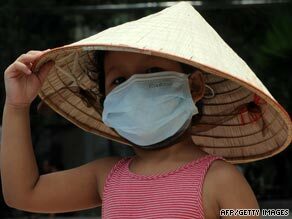 The virus has spread around the world with unprecedented speed, spreading as widely in six weeks as common influenza viruses spread in the six months, according to WHO. WHO data showed the total number of laboratory confirmed cases at 162,380, but the number could be higher since individual cases no longer have to be tested or reported. The total number of countries and territories reporting at least one case of infection now stands at 168, with new cases reported in Azerbaijan, Gabon, Grenada, Kazakhstan, Moldova, Monaco, Nauru, Swaziland and Suriname. In the United States, federal health officials are worried about the upcoming flu season. They say nearly 160 million Americans may need to be vaccinated against the H1N1 virus, but it won’t be as simple as a single shot. In a background briefing with reporters on Tuesday, two senior administration officials said the vaccine, which is still in clinical trials, would require two shots. The first shot would be followed by a second shot three weeks later. Immunity to the virus would finally kick in two weeks after that. That means someone who is vaccinated by the time the program is expected to launch in late October won’t get protection until late fall. Details of the immunization program were revealed as part of the government’s overall plan to deal with what is expected to be a difficult flu season. The federal Advisory Committee on Immunization Practices last week issued sweeping guidelines for a vaccination campaign against the swine flu strain, identifying more than half the population as targets for the first round of vaccinations. The priority groups include pregnant women, health care and emergency services personnel, children, adolescents and young adults from six months to 24 years of age, household and caregiver contacts of children younger than six months and healthy adults with certain medical conditions. The symptoms of swine flu are similar to that of seasonal flu and include fever, cough, sore throat, aches and runny nose, according to the Centers for Disease Control and Prevention. A significant number of infected people have also reported diarrhea and vomiting.